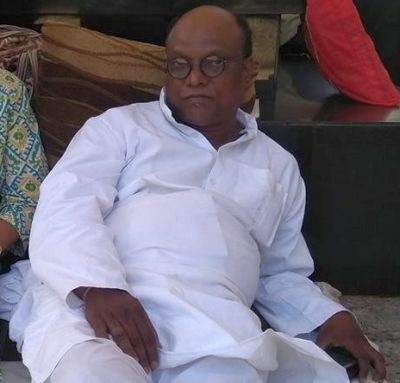 For 12 days, Goa-based RTI activist Rajan Ghate sat on a hunger strike, demanding that ailing Chief Minister Manohar Parrikar transfer his portfolios to his other ministerial colleagues. Parrikar manages the crucial portfolios of home, personnel and finance in the state government. 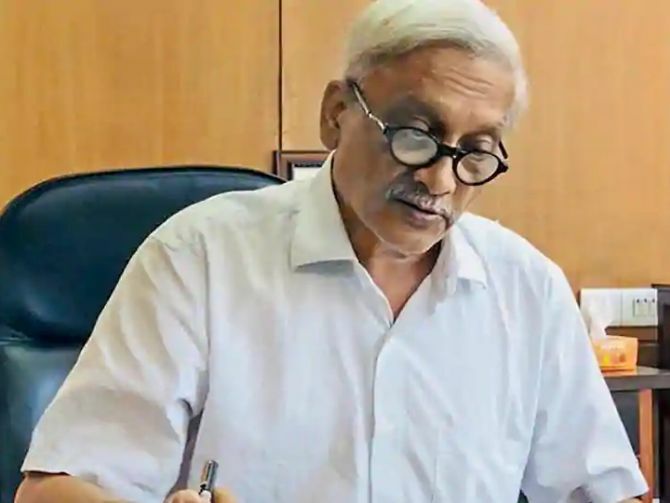 Parrikar has been recuperating at his home near Panaji since October 14 upon his return from the All India Institute of Medical Sciences in New Delhi where he underwent treatment for a pancreatic ailment. The Bharatiya Janata Party has maintained that the government it leds in the coastal state is stable and all allies are with the BJP. The Opposition parties have claimed that the Goa government is in disarray in Parrikar's absence from office. "He is not transferring his power to other ministers because he doesn't trust any of them," Ghate, below, tells Rediff.com's Hemant Waje. Why did you go on a hunger strike? I am not demanding Parrikar's resignation. Parrikar has 32 portfolios with him. I was on a hunger strike for 12 days to demand the transfer of those portfolios to his 11 other cabinet ministers. These ministers are not my relatives. One of the ministers should take on the power to run the administration. That's the only demand, not Parrikar's resignation. The administration has totally collapsed (in Goa). Nothing is happening in the state and people are suffering due to this. I sat on a hunger strike as a representative of 15 lakh Goans. Why do you think Parrikar is not divesting his portfolios to other ministers? He is a selfish person. He is not transferring his power to other ministers because he doesn't trust any of them. Now, two Congress MLAs have resigned (and joined the BJP). He has to give someone the charge. (Health Minister) Vishwajit Rane himself said that Parrikar is suffering from pancreatic cancer. My brother and father suffered from cancer and I know their suffering. He is not fit to run the administration. Parrikar is the CM of BJP workers, not the Goa chief minister. He is living for (Prime Minister Narendra Damodardas) Modi and (BJP national President Amit Anilchandra) Shah, not for his motherland or Goa. He is not quitting because he is being greedy. You take the example of Jayalalithaa. She handed over charge of her portfolios to other ministers (when she was hospitalised). Did anyone from the government approach you when you were on hunger strike? In fact, (Goa BJP President) Vinay Tendulkar called me a Congress member. But I am not affiliated to any political party. Before starting my fast, I gave them an ultimatum to fulfill my demands. On November 16, I began the fast alone at Azad Maidan (in Panaji). For two days I sat alone. Some drunk people troubled me there. But I continued to sit there for my motherland. I want to teach a lesson to all politicians. Ours is a democracy. We have been given rights from the beginning. Babasaheb Ambedkar ensured our rights. (Vinay) Tendulkar is calling me a Congressman, but I am a common man. For nine months we have been suffering from the administration's breakdown. Parrikar and Tendulkar only want power and money. The BJP is dividing us over Ram. They are dividing us saying 'He is a Congressman, he is from AAP (Aam Aadmi Party) and he is from some other party'. What kind of problems are you facing at the administrative level? The whole administration has totally collapsed. The CM is not meeting (anybody). There is no electricity or water supply. Even an important issue like formalin in fish was not handled properly. Some ministers are going to Portugal, some are going to America. But nobody is looking after the administration. All of them just want money. Parrikar has to give up all his powers to other ministers or resign. They were portraying him as a good and simple person. But he is very selfish, only working for his party and its workers. What is the stand of the BJP's two alliance partners -- the Goa Forward Party and the Maharashtrawadi Gomantak Party -- on this issue? They wanted the CMship to be given to (Maharashtrawadi Gomantak Party MLA) Sudin Dhavalikar. The MGP warned that it would contest the Lok Sabha polls and assembly by-elections in the state against the BJP candidates if the demand was not met. This is the way politicians function. Goa Forward Party chief Vijai Sardesai had said that Parrikar wanted to resign, but the BJP high command did not allow him to do so. That day he made this statement. But today he is saying, 'Parrikar is fine and watching movies. We only want Parrikar as our leader'. We don't know when he (Sardesai) will make a U-turn. Today's politics is a game of money. You alleged that a man tried to attack you while you were on hunger strike. What happened? One person named Rauf approached me at Azad Maidan wearing a helmet. He said in Konkani, 'Let's go, we will eat biryani'. Then he offered me Rs 5 crore to break my fast. I rejected it. Then he tried to attack me. One of the guys who was with me called the police. Do you know him? Is he affiliated with any party? But obviously he is a (political party) member. The BJP and state government sent him (to me). Vinay Tendulkar had already said, 'Agar Rajan Ghate marta hai, toh marne do. Hum logon ko kuch lena dena nah hai (If Rajan Ghate dies, let him die. We don't have anything to do with him)'. What is your future course of action? I have just broken my fast. My health is still recovering. Let me get normalised. I am trying to mobilise people. Now it's up to them what they want. On December 19, on the occasion of (Goa) Liberation Day, I am planning to do something.